Chris Martin scored from 20 yards out with just over three minutes remaining to lift Manhattan to a 6-3 win over Emporia. The Spartans tried to answer on the game’s final drive, but missed a 44-yard field goal as time expired. Emporia may have lost senior quarterback Braxton Marstall for the season with a broken collarbone. Emporia played this game without OL Taylor Tatman and running back Cody Campbell. Jason Randall rushed for 147 yards as Leavenworth shutout Shawnee Mission North 33-0 on Thursday night. Randall also added a 59-yard touchdown catch from Pioneer quarterback Landry Hodges. Hodges completed 14 of 19 passes for 169 yards and two touchdowns. He also added a pair of rushing touchdowns on the night. KC Wyandotte bounced back from a heartbreaking 49-48 loss to Van Horn (Mo.) in Week 1 with a dominating 48-6 win over KC Harmon. Quarterback Dimonic McKinzy, a Minnesota commit, passed for 287 yards and three touchdowns for the Bulldogs. Junior running back Antonio Moore rushed for 155 yards and a pair of touchdowns on only two carries. Coach Steve Buhler got his first win at Washburn Rural by beating Topeka Highland Park, 45-7. Blake Peterson rushed for 157 yards and two touchdowns, while Michael Singer added 125 yards and a score on the ground for the Junior Blues. Rural intercepted Highland Park quarterback Kameron Clark five times. Garden City built a 21-7 first quarter lead and made it stand up as the Buffaloes edged Woodward (Okla.) 35-34. Greyson Tempel completed 14 of 19 pass attempts for 303 yards and three touchdowns. Most of Tempel’s passes went to Mitchell Hernandez who caught nine passes for 219 yards and two scores. Tempel also rushed for 123 yards and a score for Garden City. Mill Valley built a 21-7 lead after one quarter and rolled to a 48-7 win over KC Turner. Sophomore quarterback Logan Koch passed for 122 yards and rushed for 220 yards and three scores for the Jaguars. Turner’s dual-threat quarterback Paul Berry passed for 127 yards and added 107 yards and a score on the ground. Blue Valley Southwest scored all 34 points in the second half in a 34-17 win over Blue Valley North on Thursday night. The Timberwolves trailed the Mustangs 9-0 at halftime, but took over thanks to senior quarterback Drake Herrman. Herrman completed all four of his passes for 148 yards and two touchdowns and rushed for 172 yards and two scores on 19 carries. Sophomore quarterback Brock Monty accounted for nearly 200 yards of total offense four touchdowns as Kapaun Mt. Carmel beat Wichita Southeast, 27-3. Monty rushed for 102 yards and a pair of touchdowns, and added 76 yards through the air and a pair of scores to Jack McGrath. The Crusader defense held Southeast to just 61 rushing yards on 36 attempts. Jeremiah Johnson caught a 48-yard Hail Mary touchdown pass from D.J. Jones with three seconds left to lift Wichita West to a 20-16 win over Wichita East. Jones passed for 121 yards on the night and Johnson notched his only reception on the game’s final play. The Pioneers trailed the Blue Aces 16-7 in the third quarter and East was threatening to add more. West’s Tre’von Mitchell intercepted East quarterback Alec Schillings and returned it 96 yards for a touchdown to pull the Pioneers within 16-14. It was Schillings’ only pass of the game. Girard running back Taylor Lewis ran for 356 yards and four touchdowns as the Trojans defeated the Riverton Rams 62-42. Riverton quarterback Chandler Underhill passed for 382 yards, while Landon North grabbed nine receptions for 329 yards for the Ramblers. Columbus kicker Justin Foust made a 27-yard field goal as time expired to give the Titans a 15-14 win over Fort Scott. Foust had missed an extra point earlier in the game, but redeemed himself with the game-winning kick. Columbus quarterback Nate Bole and running back Zane Roark each rushed for 100 yards in the win. Fort Scott quarterback Zach Denton and running backs Jacob Durossette and Chase Brown were each lost to injuries during the game. Goodland sophomore quarterback Trey Teeter passed for 328 yards and two touchdowns in a 30-8 win over Norton. Senior Dax Ruhs hauled in 11 catches for 170 yards and a touchdown. Senior Adam Simmerman had nine catches for 100 yards and a touchdown. The Cowboys improved to 2-0 on the season. Spring Hill improved to 1-1 with a 41-14 win over KC Sumner Academy. Spring Hill quarterback passed for 149 yards and a touchdown. Sumner’s Brian Cobbins rushed for 231 yards and two touchdowns in the loss. The Tonganoxie Chieftains ran for 343 yards and five touchdowns in a 41-14 win over Atchison. Senior running back Cole Holloway rushed for 143 yards, and quarterback Tyler Ford ran for 123 yards and two touchdowns. Atchison quarterback Tanner Huntington passed for 157 yards and a touchdown in the loss. Rossville sophomore quarterback Tucker Horak completed 15 of 22 passes for 305 yards and four touchdowns in a 33-21 victory over Abilene. Horak also rushed for 52 yards and a touchdown. Junior Thatcher Horak caught four balls for 160 yards and three touchdowns. The Galena Bulldogs crushed the Erie Red Devils 49-18. Galena, a typically run-oriented team, passed for 232 yards and two touchdowns with quarterback Kyler Cook. Gabe Helton ran for 147 yards on 10 carries. Pleasant Ridge improved to 1-1 with a 42-10 win over Jefferson Co. North. Rams quarterback Nick Holmes ran for 157 yards and two touchdowns on 13 carries. He also completed 2 of 3 passes for 62 yards and two touchdowns. Nemaha Valley improved to 2-0 with a 39-8 win over Royal Valley. Nemaha Valley ran for 254 yards and passed for 131 yards in the victory. Junior Devin Henry rushed for 121 yards and two touchdowns. Ellsworth got its first win of the season by defeating Russell 27-14. Junior quarterback Takota Anderson broke touchdown runs of 47 and 97 yards and threw a touchdown pass for the Bearcats. Mo Rojas added Ellsworth other score on a 7-yard run. Russell’s Alex Baldwin threw two touchdown passes including one to tight end Eric Rourke. The Elkhart Wildcats improved their record to 2-0 after a 26-7 win over Southwestern Heights. Elkhart senior quarterback Alex Gomez passed for 176 yards and two touchdowns, while rushing for 64 yards and two touchdowns. Senior Juston Hurn caught five passes for 103 yards, while A.J. McKinley caught four balls for 55 yards and two touchdowns. Northeast-Arma grabbed its first victory of the season by defeating Fredonia 44-14. Vikings quarterback J.T. Richardson completed 13 of 19 passes for 155 yards and four TDs, while rushing for 134 yards and two more touchdowns. Onaga ran past Leavenworth-Immaculata 69-28. The Buffaloes rushed for 440 yards as a team with sophomore David Koelzer running for 142 yards and three TDs and junior Michael Bliss running for 138 yards and two touchdowns. Plainville crushed Ellis 45-8. The Railroaders took an 8-0 lead, but the Cardinals scored the game’s next 45 points to cruise to victory. Trevor Desaire carried six times for 151 yards and two touchdowns for the Cardinals. Freshman Hayden Friend added 150 yards rushing including a 50-yard score for Plainville. Central Plains scored 24 points in the second quarter in routing Otis-Bison 40-0 on Friday night. Sophomore quarterback Braedan Crites rushed for two scores and passed for two more for the Oilers. Colton Zink began the scoring by returning an interception for a touchdown for Central Plains. The victory was the first over Otis-Bison for Central Plains/Claflin since 2008. West Elk improved to 2-0 for the first time since 2007 with a 52-6 win over Yates Center. Sophomore running back Armando Gomez rushed for 164 yards and three touchdowns for the Patriots. Paxton Noll added three touchdown runs for West Elk. Quarterback Tristen Wilson threw for 76 yards and a touchdown pass to Carson Jennings. The Patriots will get a tough road test at Udall (2-0) this week. Peabody-Burns built a 38-6 halftime lead in rolling past Little River, 46-22. Junior quarterback Braxton Kyle rushed for 174 yards and two scores for the Warriors. Fred Winsor added 101 yards rushing and two touchdowns. 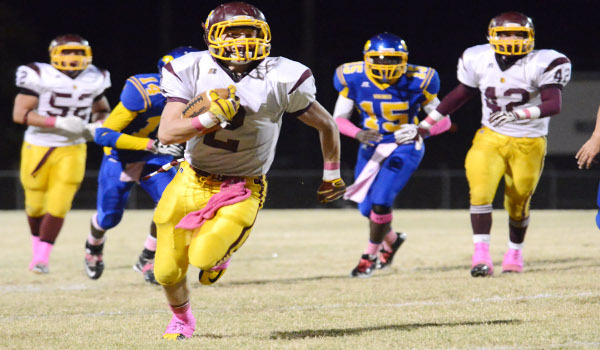 Little River was led by Grant Harvey who rushed for 102 yards and two scores. South Haven outscored South Barber 72-48 on Friday in a game that saw several impressive individual performances. South Haven’s J.T. Yunker rushed for 214 yards and three touchdowns as the Cardinals lead 38-20 at halftime. Quarterback Anthony Hawkins added 122 yards on the ground and three scores and passed for 94 yards and another score. South Barber’s Peyton Yandel passed for 185 yards and two scores and rushed for 106 yards and two touchdowns. Dylan Allison added 200 yards and three touchdowns for the Chieftains. Axtell scored 14 points each in the second and third quarters to hold off Clifton-Clyde, 44-28. Senior Derek Porting led the Eagles with 164 yards rushing and three touchdowns. Quarterback Tyler Jones added 88 yards on the ground and a pair of scores. Taylin Bird completed 9 of 10 passing for 202 yards and five touchdowns as Fowler pulled away from Minneola to win 50-24. Bird connected with Ty Clark and Dylan Duesing for two touchdowns each. Clark caught five passes for 100 yards. Luke Huelskamp rushed for 163 yards and a pair of scores for the Goldbugs. Minneola was led by Joey Harrington who rushed for 100 yards and a score. Satanta won consecutive games to open the season for the first time since 2008 by shutting out Moscow, 42-0. The Indians scored 20 points in the second quarter and were paced by Adrian Longoria and James Turpin who each rushed for two touchdowns. Quarterback Kyle Abernathy combined or 150 yards of total offense and ran and passed for a touchdown. Jackson Stull-Meiers rushed for 204 yards and three touchdowns as Natoma outscored Tescott 69-36. Stull-Meiers also had two receiving touchdowns and kicked a 35-yard field goal for the Tigers. Teyvian Frye threw for 160 yards and four touchdowns for Natoma which led 41-6 at halftime. Kyle Comstock rushed for three touchdowns to lead Tescott.